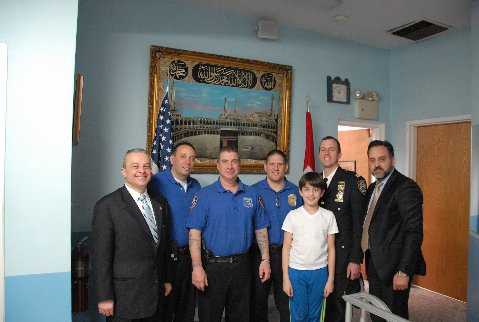 Newly appointed Police Captain Ken Quick and Police officers from Brooklyn 66th Police Precinct and New York Mayor de Blasio's Community Affair Commissioner of Community affairs Charles Fall has visited Fatih Mosque in Sunset Park, Brooklyn. The objective of the visit was to understand more about the Mosque and the activities. The Leaders of Fatih Mosques has been working with local 66th Police precinct in community partnership. Captain Quick and Commissioner of Community Affairs Charles Fall has praised Fatih Mosque for their hard work in reaching out to others in the community and to better the future of children through education. Ibrahim Kurtulus who is the Community Outreach Director for Brooklyn Borough President Eric Adams said "It was very important that NYPD officials visited Turkish Mosque in Brooklyn. The Mosque gives a great education on Islam and how to help others in order to live in peace together.Mosque Officials also work with Church Leaders in the District that shows a great parnership in different religions"